Explore the tunnels beneath Harpers Ferry. 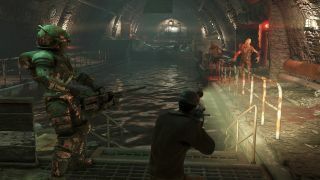 Bethesda has released more details for Fallout 76's new dungeon, The Burrows, which is arriving next week, as well as the previously announced in-game camera which is due out later this month. The Burrows were initially a drainage system for Harpers Ferry, but after the bombs fell in the Fallout universe, it quickly become home to survivors. Expect a whole bunch of challenging enemies in trying to finish The Burrows' Waste Management quest. The Burrows has been designed for two or more players at level 50 or above, so you may want to drag a friend or two along before you give it a go. Along with the new dungeon, the functional camera is coming to the game later this month, tied to a quest. The camera was first revealed back in February. First, you'll need to find the unlucky dead tourist who's holding the camera, enabling you to complete a quest that will have you taking specific snapshots to complete a 'bucket list' of sorts. Once you've got a camera, you'll be able to craft new cameras, and mod them with extras—lenses, for example. Any photos you take with the camera will be saved to your Photomode gallery. Expect other new challenges involving the camera to be added to the game. You can check out the full preview notes here, including more granular details on how to get started in the Waste Management quest. The Burrows is set for release on April 16. The camera was originally planned for the same update, but Bethesda wanted to spend a little more time working on it and haven't announced a new release date yet.